Win an Autographed Bat and a PSA Rookie Card! The 2000 Jose Canseco Home Run Contest is underway. 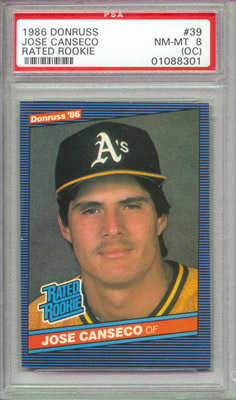 The lucky winner of this year's contest will receive an authentic Jose Canseco autographed Worth Tennessee Thumper Jose Canseco model baseball bat and a PSA 8 graded 1986 Donruss Jose Canseco rookie card! The winner of the contest will be the person who correctly predicted how many home runs Jose will hit during the 2000 regular season. The tiebreaker categories will be RBIs, then batting average, and then strikeouts. If there is still a tie after that, the winner will be determined by a random drawing. All of the predictions submitted are listed on the entries page, so you can see how you're doing as the season progresses. Here are the predictions people made for the 1998 and 1999 Jose Canseco Home Run Contests. If you have any question or comments about this contest, please email them to [email protected]. Good luck!